I was a little boy at the time growing up in "Middle Street" (next to Mr. Mac's Drug Store) where the late Ulrica Williams' Bakery now stands. The Odd Fellows "Den" used to be upstairs Fred De Nobriga's "Sweet Drinks"( and then later Miss Waldron's-Monk's mother's Store). It remained there for years. One Mr. Cambridge (at Sion Hill ) used to march at the head of the group wjhenever there was "Marching". I was too young to take in the significance of the events except to note the regalia remains the same, as I now recall. As usual, I got caught at your interesting site for ages, enjoying the photographs and letters. 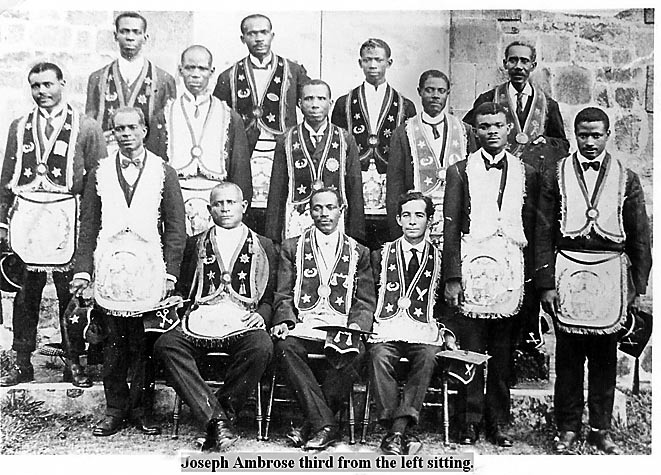 Is this a group of Oddfellows? Who are the others in the group? Are there records in existence for this group? Is anyone familiar with the regalia and the significance of the various badges? Is the fraternity still going in St Vincent? Thank you for your prize-winning site! Help with Identification would be appreciated: 1925 to 1930 would be when the photo was taken. I am sure that someone's Grandfather or Great Grand dad is in this photo. My thanks to Marcia MacDiarmid for submitting this photo. Please see her questions listed below. We know there is an Ambrose but is there a King, Dougan, Williams, Edwards, Nanton and so on?